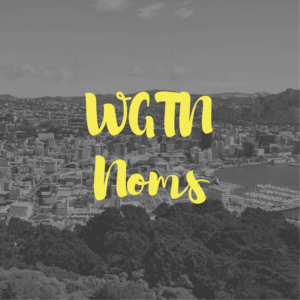 Meet Kalliana Kong, one half of Wellingnoms. Being half of Wellingnoms means that I get to do some pretty awesome things. This week I went to prison. Before that, the closest I’ve been to a prison is binge watching Orange is The New Black. I never imagined that I would be having one of the most memorable meals of my life there. 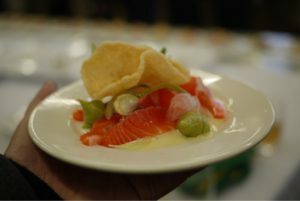 The Gate to Plate event at Wellington on A Plate (WOAP) is hands down one of the most popular events during the annual festival. For some reason this year, the folks at Corrections NZ thought that we should come along for a little preview of what the event will have to offer this year. Given that we missed out on the ballot to get tickets to the actual event, we jumped at the chance and off to prison we went. We arrived, got lost (prisons are big), got some help and were driven up to the prison’s very large commercial kitchen. Everybody asked us, where are you from? Cue awkward explanation of the social media landscape and what Instagram is – but really we just take close up photos of food and post funny, but not even that funny, captions alongside like: “Meat free Monday? Sorry I can’t hear you over this massive corned beef sandwich”. “Oh you’re from media. Welcome! Have some kombucha. The inmates made it themselves.” So far, so good. The man himself, Martin Bosley, started off with some words about the event. Ending with a comment about rehabilitation only being half of the process – it’s once these men have left the prison that they need continued support and society lets them down by not giving them jobs or opportunities. He urged us to consider hiring ex-inmates for jobs. Later, I found out the other guests were from local businesses, so potential future employers. We started quite quickly with an array of canapés. Tiny bites of deliciousness with the locally caught eel standing out as a surprising favourite among the crowd. Moving on to the entree, a salmon and avocado dish served with a yuzu dressing. With the price of avocados lately, this dish was a hit. 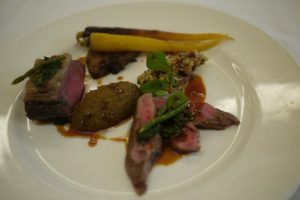 The lamb main quickly followed, with a bit of tongue sneaking in – not what you think! Lamb tongue, as it turns out, is super moreish and I have no qualms eating leftover lamb tongue off other people’s plates. I’m not one to dwell on dessert but I will say I’m always going to be a sucker for perfectly tempered chocolate. I’m sure there’s a picture right about here that you can drool over! 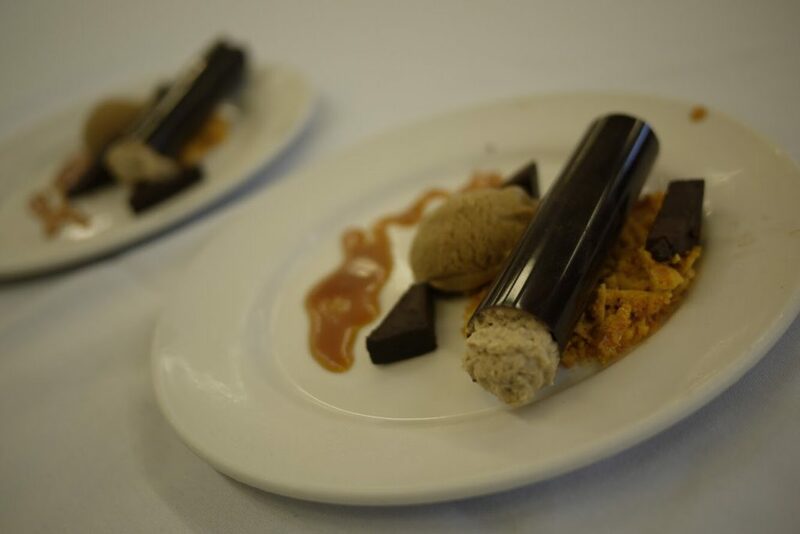 That’s smoked banana mousse encased in that chocolate but actually, the liquorice ice cream was the best part of the dish. As quickly as the food appeared, the empty plates and glassware disappeared. This kitchen feeds over 1200 folks a day. It’s definitely going to be well run. If only my kitchen at home was as efficient. We spoke with one of the chefs/inmates, Leighton, who told us how different the world is now compared to when he went into the prison system 17 years ago. A lot has changed. He’s allowed to leave the prison for work experience and a task as everyday as catching the bus was daunting for him on his first day. He said gaining skills and qualifications is the best way to get reoffending rates down but reckons too often it’s a political issue, a problem that often gets forgotten. Prisoners, for the most part, know they’ve done wrong. They just want to do their time and become a better person before they have to go back out into the real world again. He summed up his first WOAP experience 5 years ago in one word – daunting. It’s not often that they interact with people from outside of the prison, let alone get all lined up to greet guests coming in to eat their food. Before we left, we went over to say goodbye and thank you to all the chefs. It wasn’t until a guard came over to us and thanked us for taking the time to tell the boys what a great job they’d done that we remembered we were in a prison for lunch. We wrapped up our day with someone asking us, was the inside of a men’s prison what you expected? Our consensus was – it’s really clean. Like cleaner than hospital clean. It’s easy to gush over the food. Yes, it was amazing. But really, it’s the people behind the event that make it so successful. A great meal during WOAP? You can get that at a lot of places. A great meal during WOAP, prepared and served by prisoners at an actual prison? Well. That’s why it’s sold out and tickets are allocated by ballot. To see the amazing food photos that Wellingnoms takes, follow them on Instagram, they also have a Twitter account and Facebook page. They’re so social media. If you want to invite Wellingnoms to attend your function/restaurant for review then contact them at this email address: wellingnoms@gmail.com.